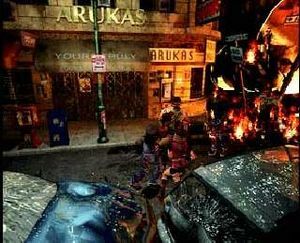 Resident Evil 2, like its predecessor, has been ported to several different platforms, each one being unique and adding new content each time. The game was originally released in North America for the PlayStation on January 21, 1998, with the latest release being in Europe on the GameCube (on May 30, 2003). 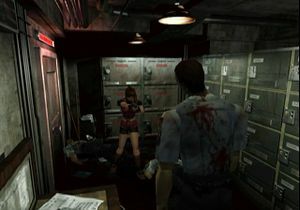 There are some slight differences with the Japanese release of Resident Evil 2: it was made easier for the Japanese audience, such as creating changes with the item and weapon placement, increased firepower in weapons and auto-aim turned on by default; on top of this the game over screens were censored with much of the violence removed. Released in North America on January 21, 1998, the PlayStation version of Resident Evil 2 is the first and earliest build of the game. It features the same gore in the North American and European releases, however, the Japanese version is censored in some of the game over screens. All PlayStation versions have two modes: easy, in which the player starts with one hundred and twenty handgun bullets as well as increased firepower and easier enemies (the Japanese version features simpler item and weapon placement, an even larger firepower increase and auto-aim turned on by default) and normal (which has no benefits to the player). As for the graphics, the PlayStation is sub-par, but obviously better than the Game.com version. Backgrounds are pre-rendered, while many of the 3D models are somewhat blocky and have no anti-aliasing applied. Months after the PlayStation version came out, Capcom released the PlayStation DualShock version, which contains support for the new analog and vibration features of the then new DualShock controllers. Released on August 6, 1998 in Japan, the DualShock version also adds many more features such as an Arrange Game, which includes Rookie Mode (much like easy mode but with the Gatling Gun, MAC-11 SMG and Rocket Launcher in your inventory at the start of the game) and "Extreme Battle" mode. 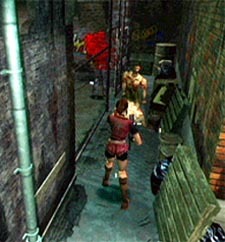 In "Extreme Battle" mode, players have the ability to choose four characters (Leon, Claire, Ada, or Chris Redfield) to fight several enemies in different levels with a certain amount of time. Also included with the DualShock version was a cheat code that could be entered to receive infinite ammo for all weapons and a grade for the 4th survivor scenario. The Japanese release also features a USA mode, which is similar to the North American normal mode. The graphics remain the same as in the original version. Released on November 19, 1999 in North America, this version was ported by Angel Studios (now Rockstar San Diego) and features the most drastic changes. While it was the only port of the game that did not feature the "Extreme Battle" mode, it did contain a slew of console-exclusive features. The most prominent was a series of additional in-game documents known as the "EX Files" that connected the plot of the game with the other games in the series (including the then-unreleased Resident Evil Zero). Other features include an item-randomizer, violence control (allowing players to change the color of the blood), first-person controls and new unlockable outfits replacing the ones from the previous versions. The game supports the Rumble Pak and the Expansion Pak. The N64 version is notable due to the compression techniques that the developers were forced to use in order to fit 2 CD-ROMs worth of data (including voice acting and FMV) into a single cartridge. The graphics are on par with the PlayStation version. The Dreamcast version has all of features from the DualShock version, and also adds some smaller features. Released on December 22, 1999 in Japan, this version features the benefit of viewing the character's health in a VMU and also has the "Extreme Battle Mode" from the DualShock version. The Japanese version (titled Biohazard 2 Value Plus) was bundled with a demo of Resident Evil Code: Veronica which contains assorted music from several Resident Evil soundtracks released in Japan. Models appear as detailed as they are in the Windows 9x version. A direct port of the original PlayStation game based on the DualShock version, the GameCube release lacks all of the added content from the Nintendo 64 and Dreamcast versions. It was first released on January 14, 2003 in North America, as part of the several re-releases of older Resident Evil games (to contemplate the release of Resident Evil on the GameCube). An Arrange Mode has been included, which is similar to Rookie Mode from the DualShock release, and the game's graphics have been improved slightly, with the game's FMV sequences now running at 60 frames per second (compared to the previous releases which only ran at 15 FPS) but with heavy compression artifacts, though much higher in quality than in the N64 port. Cutscenes and dialogue can now be skipped as well (similar to Resident Evil 3). Models appear the most smooth on this version, with some anti-aliasing applied to them. 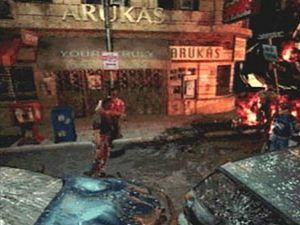 Called Resident Evil 2: Platinum in its North American release, the Windows 9x port of the game, first released in Japan on February 19, 1999, was based on the DualShock version and contained all of its added features (except analog and vibration support), as well as an added Gallery Mode, featuring several unlockable illustrations, renders and character models. Since the DualShock edition was not released in PAL territories, the Windows 9x version introduced Extreme Battle mode to European players; a hard mode is also available after completing the game once in both scenarios. The Windows 9x release offers much more detailed graphics, with models appearing smoother and more detailed, as well as higher resolutions. Released on November 11, 1998, the Game.com version was a downgraded port that has almost no features similar to the original release. The game is much shorter, more simple, and only features Leon's Scenario A and a limited set of items. 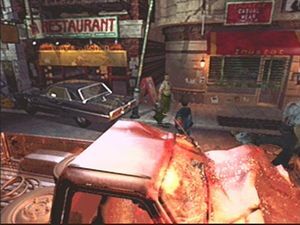 Two versions for the Game.com were planned, one starring Leon and the other with Claire, but only the former saw release. This version has the worst graphics, with players having to wait for full animations to run until they can actually move (leading to slow, almost painful gameplay). This page was last edited on 15 June 2017, at 15:21. This page has been accessed 25,359 times.